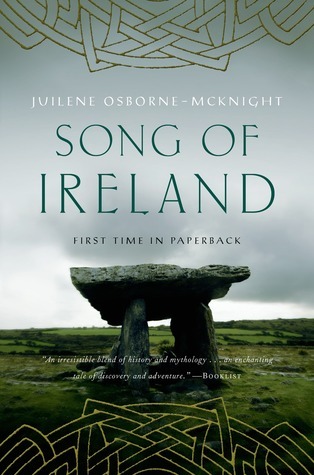 Celtic scholar Juliene Osborne-McKnight’s novel Song of Ireland is a very enjoyable dramatization of the arrival of the Celts in Ireland and their clash with the Tuatha de Danaan. To start off, Osborne-McKnight does a wonderful job of drawing the ancient Celts as a people with a nomadic spirit, moving around Europe and as far as Egypt as mercenaries, attracting respect and riches wherever they went. The life of Amergin, son of warrior king Mil, is vivid and she gives a real sense of their beliefs, social, and religious structure. As a founding myth, the idea of the Irish being fundamentally nomadic in our core puts a more positive spin on decades of emigration, and is a valid reading of our history. Mil has long felt a burning desire to go to Ireland, the Isle of Destiny as he refers to it, where he believes he is destined to bring his people. He uproots the entire tribe from their comfortable life in Egypt and sets out to cross Europe to his ancestral homeland in Northern Spain. On the way, his son Bile is horribly injured in an accident, and nursed by Amergin and Skena, a healer taught by the Egyptians. Amergin and Skena fall in love and life seems almost perfect for Amergin as they arrive in Galicia and are reunited with the rest of the tribe. He completes his druidic training with the tribal elders, and moves from being a boy to a man, and because of his status as a druid and powers as a poet, he has an influence among the people that belies his youth. Then the scene switches to Ireland, where it transpires that the Tuatha De Danaan are an alien race who live on Earth in secret. They possess powerful technology that enables them to live for thousands of years and heal all manner of genetic defects and injuries. They are governed by a triad of three women, Eriu, Banba, and Fodla, who must use the power of the Lia Fail, a device that shows them the past like a film, to decide what to do about the approaching Celtic fleet. Osborne-McKnight weaves Celtic Myth into an engaging yarn and manages to “explain” many of the touchstone elements of the Tuatha de Danaan stories. The society she imagines for the exiled aliens — willingly exiled in order to escape conflict — is interesting, but it all felt very 1980s: “Gray” aliens using illusion to hide themselves. They even “abduct” sick Firbolg children and correct their disabilities. Ultimately, my issues with the book were down to my expectations and associations, rather than Osborne-McKnight’s writing; I wasn’t expecting a tale of aliens hiding on Earth, even if it was well wrapped up in Celtic myth. Once the Celts arrive on the island and the various stages of hospitality, suspicion, and conflict are acted out, the enlightened aliens make the decision not to destroy the comparatively primitive Celts and share the island with them. The Tuatha will stick to their cities under the ground, while the Celts will have the surface. Of course, the dark triad of the Morrigu are only too happy to mess with the minds of the celts, but you can’t control everything. Though it felt like the final act involved a little too much tying in of different myths and stories, the characters of Amergin, Eriu, and Bile carried the story to a fairly satisfying conclusion, and you do get emotionally involved. Ultimately, anyone wanting to learn about the myths of the Tuatha de Danaan would enjoy Song of Ireland and learn from it. The characters of the major players are well-drawn, even if the overall story feels a little too tidy and technological to sit well beside the original myths. It was lovely to read a novel that’s so saturated with Celtic myth and motifs, and also one that understands the central and advisory role of the druids in Celtic society (or at least that seems to have drawn conclusions similar to my own). I look forward to reading her other books about Irish myth and legend. You can find out more about author Juilene Osborne-McKnight and her work on her fascinating website….